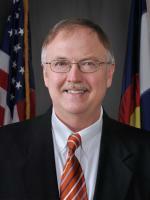 Tom Clements, Colorado’s top prison official, reportedly was shot and killed last night while answering the door at his home in Monument, El Paso County. Motives surrounding the shooting are unclear. There are early reports that security for other Colorado officials has been tightened. Gov. John Hickenlooper has ordered flags be lowered to half-staff all public buildings statewide. Hickenlooper is scheduled to sign gun-control legislation into law in Colorado today after a mass-shooting at a movie theater in Aurora last year. The governor used Facebook this morning to address Department of Corrections employees about the shooting death of Clements. “I can hardly believe it, let alone write words to describe it,” the governor said. Clements was 58. He is survived by his wife and two children.